(Nanowerk News) Researchers are demonstrating revolutionary robotic techniques inspired by plants, featuring a 3D-printed ‘trunk’, ‘leaves’ that sense the environment and ‘roots’ that grow and change direction. Humans naturally understand problems and solutions from an animal’s perspective, tending to see plants as passive organisms that don’t ‘do’ much of anything, but plants do move, and they sense, and they do so in extremely efficient ways. Barbara Mazzolai of the Istituto Italiano di Tecnologia (IIT) coordinates the FP7 - PLANTOID project, funded via the Future and Emerging Technologies (FET) scheme. She says humans can learn a lot from plants. ‘Our aim is to design, prototype and validate a new generation of ICT hardware and software technologies inspired by plants.’ And she sees potential applications for such technologies in agriculture, medicine and even space exploration. The PLANTOID prototype was designed with two functional roots: one root demonstrates bending capabilities, responding to input from the sensors at the tip of the root. This way the root is bending away from a stumbling block or aggressive or toxic products. A second root demonstrates artificial growth. ‘Layers of new material are deposited near the tip of the root to produce a motive force, penetrating the soil,’ Mazzolai explains. Practically, the robot grows by building its own structure and penetrates the soil. The roots are connected to a trunk housing a micro-computer. The trunk itself is made of plastic and was produced using a 3D printer. 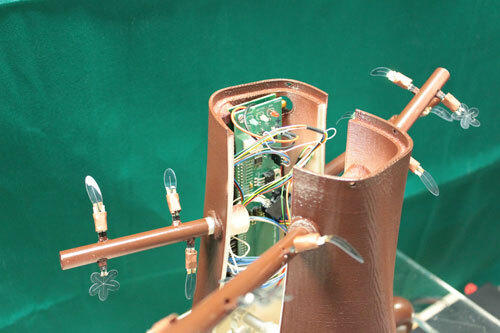 Finally, just like natural leaves, the ‘leaves’ of the PLANTOID robot include sensors that can assess environmental conditions, including temperature, humidity, gravity, touch, and chemical factors. Backed by EUR 1.6 million of EU funding, the PLANTOID project is the first to design and develop robotic solutions based on plant models. The prototype is not meant to serve a particular application as such, but represents a demonstration of new robotic techniques. However, Mazzolai says real-life applications in the future could include detection and assessment of pollutant concentrations, e.g. heavy metals, or nutrients in the environment, as well as mapping and monitoring of conditions in terrestrial soils. Indeed, plant-like robots could be uniquely suited to space exploration, able to dig and implant themselves on alien worlds, following sensory leads while adapting to potentially harsh external conditions. Other promising applications could include flexible endoscopic robots for delicate surgical applications in the medical field, while larger plant-like robots could be of use in search and rescue operations, for example after a natural disaster. Dr Barbara Mazzolai, IIT's coordinator of the European project Plantoid and senior researcher at the Center for Micro Bio-Robotics in Pontedera (Pisa), explains the main motivations and goals of the project for the next few years. ‘Plants are very efficient in terms of their energy consumption during motion,’ says Mazzolai, ‘and this suggests many approaches that are muscle-free and thus not necessarily animal-like for the world of robotics.’ Indeed, the unique characteristics of plants could become a source of inspiration for new companies that can produce smart and useful plant-like robotic devices. PLANTOID researchers are set to complete the three-year project in April 2015. They are now working to integrate more functions into a single root, to both penetrate and steer in the soil. Other interesting topics include plant structures that can exploit external environmental energy. And they are asking whether plants are capable of ‘intelligent’ behaviour, i.e. if the robot’s growth can change over time, based on previous experience. This could lead to the development of even ‘smarter’ devices with the ability to sense, but also to follow stimuli and take decisions.